Sunrise Villa is a luxurious home with spectacular views of the Atlantic Ocean, bay and mountainous terrain of unspoiled Grenada. The villa is beautifully designed and furnished with an open living area, a well outfitted kitchen, large verandah and deck to enjoy Grenada’s spectacular views. The grounds are beautifully landscaped with a profusion of tropical flowering plants, bushes and trees. There is a small beach only a short walk away. The master bedroom with private bath opens unto its own deck with captivating views of the bay and beautiful Grenada. The second bedroom has a queen size bed with full private bath while the third and fourth bedrooms (a family suite) share a large full bathroom. An additional full bathroom is located near the deck area. Sunrise Villa has a spacious outdoor verandah with a large crystal clear, chemical free, eco friendly, fresh water swimming pool. It’s literally like swimming in bottle water with no chemical additives to damage your skin. Laze by the pool while enjoying spectular views of the ocean, bay and scenic Grenada. You would absolutely love it! Grenada is a destination with a wealth of natural attractions. The beautiful beaches are one of the islands biggest draws. There are many excellent restaurants and beach bars where you can enjoy a meal or late afternoon cocktail. Grenada has immaculate coral reefs which are ideal for diving or snorkeling. Enjoy an afternoon cruise on a luxury yacht and stop for a snorkel along the way. Dive charter companies offer dive excursions for certified divers. The diving conditions are some of the best in the Caribbean. Great visibility, warm water temperatures and moderate ocean currents make for a relaxing and enjoyable diving environment. The reefs are spectacular. Colorful hard and soft corals are home to masses of reef fish. On deeper wall dives, you may see some pelagic, turtles, rays and wrasse. Yachting is a favorite pastime and there are many boat charter companies offering cruises as well. On the island itself, you can keep yourself very busy exploring all the natural wonders. The Grand Etang Lake and Forest Reserve is a beautiful natural resource located high up in the island's mountainous interior. The lush forests are home to a wide variety of wildlife including birds, monkeys, frogs and lizards. The lake is one of the few high altitude lakes in the Caribbean and spectacularly beautiful. There are many different hiking trails that range from a short 30-minute loop to longer day hikes. There are several sporting facilities on Grenada. You can enjoy a game of tennis or round of golf at the Grenada Golf and Country Club. The entire villa is rented to one guest group at a time with the rates quoted on 2 guests plus $500.00 for each additional bedroom used (double occupancy). This is very cost effective as you do not pay for unused bedrooms. For example, one or two guests renting the villa can enjoy the privacy of the entire villa at the lower rate. We only ask that you utilize the bedroom (s) chosen to keep the cost affordable. Additional guests must be included in the original booking (or prior to arrival). Weekly housekeeping included. Daily housekeeping and driver available upon request at additional costs. My family and I had a wonderful time staying at Sunrise Villa. The location is perfect, less than 20 minutes from the airport and St. George's and close to so much that Grenada has to offer. The house is spacious with four bedrooms, a large living area, and well-stocked kitchen. We had dinner and breakfast outside every day on the porch. The wind kept the pesky insects away. The bedrooms have air conditioning should you want but the fresh air and breeze is much better. Wifi works throughout the house, although service occasionally drops. The kitchen has just about everything you need to prepare meals. The pool offers great views of Grenada and the ocean, and the well maintained gardens are a treat to explore. Depending on when you go, the fruit trees may have some tasty treats. We enjoyed using some of the fresh limes. A lot of birds and lizards hang around the property. Be sure to go out to the patio on a clear night to enjoy amazing views of the stars. Valerie, who lives separately on the property, took good care of us. She was there to greet us when arrived. She respected our privacy but made sure everything was okay with the house. She can tell you a lot about Grenada. Yvonne did an excellent job communicating with us and ensuring all was in line for our visit. Thanks Jeffrey for the lovely review. We are so pleased that you and your family enjoyed our lovely island of Grenada and all its natural beauty. We are delighted you enjoyed the comforts of our home and hope to welcome you for another visit real soon. We go to the Caribbean every winter and we always rent a villa. Sunrise villa is one of the nicest villas we have rented. It is large clean and well maintained. The kitchen was supplied with everything you would need. The view from the back of the house was breath taking. We saw rainbows every day. One rainbow was so close we could see both ends of it. The pool was good size and enjoyed by all. There was lots of time to sit around in the sun and relax. Our son and his family joined us for a week. We went to the beaches and did some hiking. The water falls on the island are amazing. It is interesting island with lots to see and do. Many thanks to Yvonne for letting us rent her lovely home and Theresa the caretaker for welcoming us. Thanks Dave and Nancy for your wonderful review. Theresa and I try our best to make sure all our guests have a relaxing, worry-free stay and enjoy our incredibly beautiful island. Please come again. We really enjoyed having you and your family at the villa. My wife and I, along with our friends from Alaska stayed at Sunrise Villa for 9 nights. We were more than pleased with our decision to stay at this location. The villa was very nice. Well kept and very comfortable. The pool out back was great. The view from the pool area made each day just that much better. Yvonne, who assisted us with the rental, and Theresa the onsite caretaker were both very helpful and were always there for us. They made sure we had a great time. The purpose of our trip was scuba diving and some time in the sun. Aquanauts provided the dive services for us. We highly recommend them. Very professional and always safety first. They made sure we got the most from our diving vacation. We tried a number of different restaurants that were recommended by our dive masters. We did not have a bad meal. They were all great. We did find that making reservations certainly helped as some of the restaurants were small and filled up quickly. We used a rental car during our stay. Coming from North America we initially found the driving conditions and style a bit challenging. It did not take long however to get into the swing of things. Once we got our directions down, it only took 15 minutes to drive to the dive shop and between 15 and 20 minutes to drive to most of the restaurants we went to. Having GPS is a must. The roads are narrow and not always well marked. We plan to return to Sunrise Villa again. We simply had too much fun to not come back. We highly recommend Sunrise Villa. Thank you for a wonderful review Allan. So pleased you all enjoyed your dive vacation and your stay at Sunrise. We try very hard to make our guests feel welcome and at home. So I'm glad we've accomplished that. I must agree, the pool view is quite stunning with the Atlantic Ocean and Grenada's lush terrain. Theresa and I loved having you stay and we look forward to your next visit. We had a fantastic time at Sunrise villas. There was plenty of room for our group of 4. The villa was lovely and the views were spectacular. Nice quiet neighborhood but conveniently located with a 15 min drive to Grand Anse or Georgetown. Theresa the caretaker, who also lives at the house was there for our every need. Grenada is an amazing place and is definitely worth discovering. Thank you Collin. I am really happy you all enjoyed Grenada, the diving, the spectacular scenery and your stay at the villa. Please visit again soon. Amazing views that go beyond the photos! From the word 'Go', Yvonne was highly responsive to any and all questions that we had - she was very helpful with our trip planning. Yvonne had arranged to have a driver (Ian Basptiste - check out Trip advisor) pick us up at the airport and take us to the Villa, as we arrived late. We would highly recommend Ian Basptiste to act as a tour driver and occasional taxi service. We used Ian as all the rental cars on the island were sold out - it was Christmas! The views from villa are amazing. Full stop! Because the villa is up a hill on the easterly side of the Fort Jeudy, there was always a breeze. This breeze was nice given the hotter and humid days. The wifi was very helpful, with very good speed for the island. my wife and I could use it for work, including a GoTo Meeting without a problem. Cable TV to both the living room, and a raised level TV watching area near the kitchen. Perfect when we wanted to watch different cable shows one evening. Plenty of space in each bed room, but we only used one. Closets and dressers to use. They also have a video surveillance system, which adds a level of security. The property overall is very well looked after, especially with the caretaker whom lives in the efficiency next door. The photos are accurate in showing the slightly different style furnishings, which work well together. All in very good shape, and comfortable. We went for a nice walk down to a little secluded beach. Great view out to a protected bay facing westerly. Soft black sand. Thank you Brian for your wonderful review. I am so pleased you enjoyed Grenada and the amenities and beautiful views from the villa. Please tell all your friends and hope you visit us again soon. Spacious accommodations, Great Views, Good Times!! Thank you for the review. We are very pleased you enjoyed the accommodations and the wonderful views from the villa. What a great family. Looking forward to your return next year. 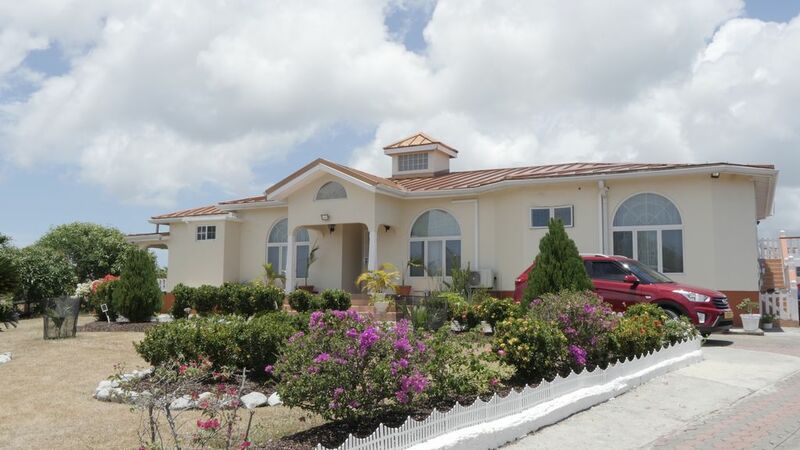 Sunrise Villa is 20 Mins from the Airport and 15 Mins from the town of St. George's). Grenada is a safe, romantic and relaxing destination. Visitors would enjoy our pure white sand beaches, our lush vegetation, several waterfalls, and rain forest. A variety of watersports are available in Grenada, including parasailing, kayaking, diving and cruising. Eco tours around the island will allow you to enjoy Grenada's natural beauty and the warmth of its people. Divers must visit our underwater sculpture park which has become an international attraction, ranked top 5 in the world of dive sites. Relax by the pool and escape from reality. Come see for yourself. You would not want to leave. *Free transport to/from airport* **Private driver with mini-van available** ***On-site Caretaker will check you in*** The entire villa is rented to one guest group at a time with the rates quoted on 2 guests plus $500.00 for each additional bedroom used (double occupancy). This is very cost effective as you do not pay for unused bedrooms. For example, one or two guests renting the villa can enjoy the privacy of the entire villa at the lower rate. We only ask that you utilize the bedroom (s) chosen to keep the cost affordable. Additional guests must be included in the original booking (or prior to arrival).